The Newport HT70 Ventilator combines ease of use, clinical finesse, exceptional portability, and ruggedness in one compact package. Designed for patients 5kg and under to adult, the HT70 is ideal for home care, transport, hospital, long term care, and emergency preparedness applications for invasive or noninvasive ventilation. The full color touch screen is easy to navigate and offers specific screens for homecare, transport and hospital applications, default or customizable presets, Alarm Quickset and Help functions. 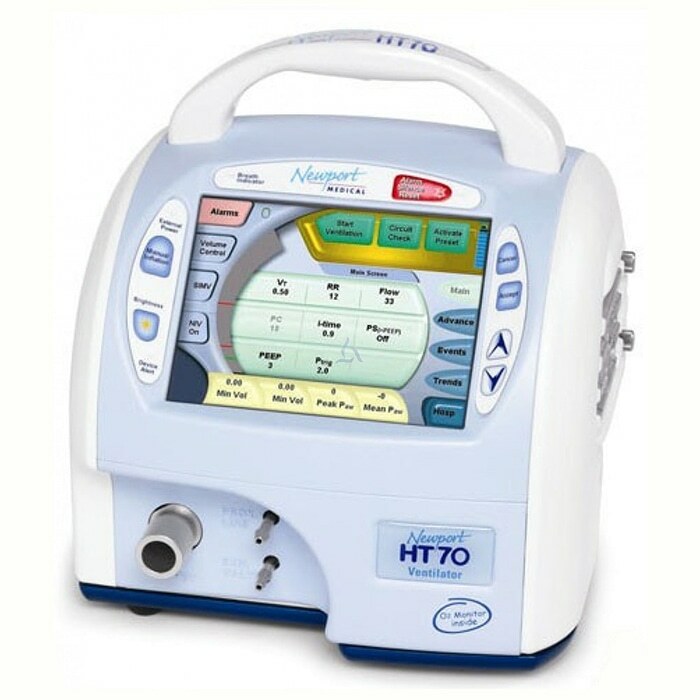 Developed and manufactured entirely by Newport Medical in California, USA, the compact HT70 features a newly designed, patented, micro-piston technology that eliminates the need for external compressed gas. The hot swappable integrated battery system provides up to 10 hours of operation at standard settings and can be fully recharged in only 3 hours. For a long transport, a full day at the park or in case of a power emergency, the HT70 allows for virtually continuous operation.